Home is where the heart is, is not always the case. Home is where the comfort is. Home is where you are. Home is where there’s a designated place for each one of your belongings. In today’s urban living, apartments are only getting smaller and higher up in the sky. While many of us would like to believe that our apartments are big enough, it still mostly falls short for our stuff. Because let's be honest, there’s so much of it. Don’t we all love original tiny apartment living? Well, most of us do. However small or not so small your place, it takes meticulous planning to make your space as functional as possible. Not all of us may have the understanding as to how to use a space to its maximum potential. But wouldn’t we all want to know ways to stretch out the space utilization and functionality of our tiny apartments? Hell yes! Lucky for us, Pallavi Singh, a regular at the Homes & Gardens community on SHEROES doles out some hacks to turn a tiny apartment into a comfortable home. More often than not, it’s about how well done up and organised your space is instead of how big the area it covers is. A tiny apartment if kept the right way can serve you the same as a big place. After all, it’s the quality that matters and not the size. One reason why cottage houses are much in demand. A tiny apartment is cosy, dreamy and fortunately, easy to manage. With less space, one can focus on the quality of items they put to make it a functional home of their dreams. To help you turn your tiny apartment into its best version, we have curated simple ways to make the best of your tiny space. #1. Declutter and get rid of all the stuff that you do not need. 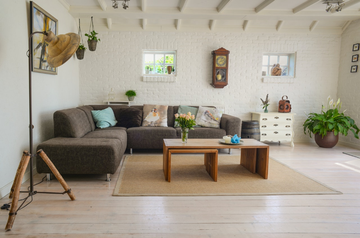 The very first step towards a setup or redoing a house is decluttering everything unnecessary and extra. What better than the very famous and trending KonMari Method. In case you're already not aware Mary Kon is a pro organizer and her minimalism-inspired approach to decluttering your stuff category-by-category rather than room-by-room is the idea behind the world famous MarieKondo Technique. The goal of the KonMari Method is to have a house full of items that spark joy. This minimalist approach would give you a great idea of what to get rid off, leaving your house inhabiting only the best of the items and only the rings you love. Many like to believe that de-cluttering space around you essentially declutters your mind as well and we personally agree. Not only does it bring you joy, but it also makes it easy for you to maintain your apartment. #2. Fill up your apartment with natural light to open up your apartment’s living space. Lighting of a room or apartment is very essential for it to look spacious. Natural lighting not only keeps your living space fresh and ventilated, but it also broadens the space of the house. Whether you have one window in your apartment or ten, you can easily maximize their natural light powers by opening them to the room. You can maximise lighting in your room by strategically placing mirrors that reflect light into the room. Once you start playing with mirrors, it’s easier to understand how to trap the maximum amount of light in your home. If you still feel the need for more light, think ‘light’ with your colours too. How? Choose lighter colours as often as you can. White walls may be boring but they always make space look bigger. Picking white and other light colours like beige and off white will help reflect natural light in your home, making it look bigger. On the other hand, dark colours absorb light leading your rooms to look smaller and dull. While these are all plain facts, it doesn’t mean you stick to boring. Feel free to play with light pastel shades of any colour you like. #3. Instead of using curtains as a room divider, use a bookshelf to create more storage areas. Do we ever have enough storage? No. Especially with a tiny apartment or room, one could always use a little extra some to store things in. One such way is to use a bookshelf for a dual purpose. Dual purpose furniture has gained popularity because of its being so versatile when it comes to its looks and use both. A beautiful bookshelf, an antique looking one or even made of basic rack wood serves both as a storage for your books and other display pieces as well as a divider for the room. The bookshelf will add both life and character to your living space while being extremely useful for storage. What better way to flaunt your taste in books while actually using up your space to the maximum? #4. Instead of plain old chairs, go for seating that serves double duty, like storage couches. Using shelves is usually a great idea for storage, but too many shelves in the room can hamper both the aesthetic as well as the space of your room. The ultimate storage solution here is to turn your couch or chairs into a mini storage unit by implementing sliding drawers. Or by going for boxy multipurpose storage couches and beds. These drawers can store lots of things, almost eliminating the need for a shelf in the entire room. And they look pretty damn modern as well. It's not just practical but also simpler to just go in for fewer multipurpose furniture that will serve you just as well. Lucky for us there is a wide variety of multipurpose furniture items available for us to buy in the market. From storage beds to expandable console tables, there’s a hundred innovate multipurpose furniture pieces that can help you use your space super efficiently. Almost every piece of furniture exists in a multipurpose form if you do your research and find one. Also, It’s fun to show off your transformer like furniture to your guests. You’re automatically the coolest one in the block. Using fairy lights is the easiest and the cheapest way to revamp your boring room into a cosy paradise. The best part? You can use fairy lights literally anywhere and in your room. Whether it’s wall fairy lights to a fairy light curtain, mirror fairy lights or even fairy lights in a bottle, it’s difficult to go wrong with them. Cheap to purchase, easy to replace, they come in different colours and different and even adjustable intensities to fit each mood. If you’re looking to pep up your room a bit more, adding pictures or making patterns with it also changes the whole face of your room. While light colours add space to the room, a pop of colour makes your space interesting and full of character. Don’t hesitate to play around with colours when it comes to your room. A pop of colour here and there can transform a boring room to breathtaking. Want to add colour to a room but don't want to make a big commitment? No problem. There’s so much that can be done. You don't have to spend a lot of money either to get a nice change and pick-up to the look of your room. Hang a colourful tapestry on the wall. Use colourful pillows and throws. Replace boring neutrals and go for curtains in a crazy colour. Invest in a colourful couch. Or a colourful rug. Upholster a set of dining chairs in vibrant colours. Or simply get one striking piece of wall decor and that’s all you need to colour up a room. The art and colour in your house is a representation of your personality. What better place than your house to show it? If you’re sick of searching through a drawer full of scarves every time you go out, get them organized and on easy display in your closet. It won’t take up much time or room at all. If you have a lot of scarves, stuffing them in a drawer, makes it hard to browse through them. And draping them over a hanger usually just turns into a jumbled mess. But there is a way to neatly organise them. Here’s how. Add some shower curtain rings to that hanger, though, and suddenly you have an organized, an easy-to-keep collection of scarves that won’t take up much space. Same can be done to organise bags and belts in no time. All of this, for very little cost and effort. Here’s an example of another multipurpose furniture piece. Maximize your space while keeping things neat and tidy with a bookcase desk. Using a bookcase as a shelf again serves a dual purpose while taking half the amount of space. Whether you buy a new one or repurpose an old bookshelf, it would be totally worth the effort when it comes to utility and space utilisation. After following all the tips given above, there are chances that your apartment looks a bit too spacious by now. If that is the case, we have a remedy for it. A gallery wall. Gallery walls are a trend that seems to be able to stand the test of time and for good reason. Whether you’re just beginning to carefully curate your favourite pieces of art, or you already have a gallery wall that you’ve been adding on to for years, displaying art in your house is always a great idea. There are 100 unique ways to display art. You can mix up your idea of a gallery wall by simply placing two oversized frames next to each other. Or one big centre art piece followed by smaller ones. You experiment with types and colours of frames to suit your gallery art. White frames blend in while a dark one makes it more impactful. Whether it’s memories you decide to put up on your wall, or your taste in art, it’s always a great idea to speak up your mind and heart through. Walking into your home gives out an element of your life. That’s what makes a house a home. The Homes & Gardens community is filled with your vibrant posts and useful home decor tips. Pallavi Singh shared some amazing hacks in her posts to make your tiny apartment spunkier and spacious. What do you do to make your apartment look airy and spacious? Tell us in the comments below and head to the Homes and Gardens community for more action and conversations on home decor, cleaning tips and hacks. I will definitely implement these ideas.